Halloween is a mere two days away, but the trick-or-treaters around here are headed out tomorrow night. If you haven’t even begun to think about Halloween festivities, no worries! Here’s a little last minute Halloween Party roundup to give you a hand. 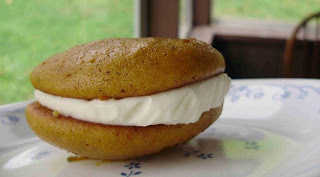 Pumpkin Whoopie Pies (because at Halloween, you can never have too much pumpkin) – This recipe is brought to you courtesy of Lindsay who blogs over at PACountryCrafts. While I haven’t tried out this recipe yet, rumor has it that Lindsay is a whiz with pumpkin. Don’t believe me? Check out her posts on How To Cook A Pumpkin, and Pumpkin Muffins. Owl Cupcakes – Here’s looking at you, kid. I Am Momma Hear Me Roar is one of my favorite blogs! It’s always full of wonderfully creative ideas for cooking, crafting… you name it. Many thanks to Cheri for sharing some of her last minute treat ideas. While you’re there, check out the “Crow’s Feet” too. Oh, my tummy is grumbling just looking at all that goodness! Spooky Glowing Eyes – This first decoration idea is thanks Sister Dianne, who heads up another one of my favorite blogs, CraftyPod. Trust me, you don’t need to have a crafty bone in your body to pull off this quick and easy decoration idea. Click on the link to watch her short tutorial video. Needle Felted Eyeballs – Yes, more creepy, eerie eyes. This decoration idea is brought to you via Michelle from Etsy and Nguyen Le from KnitKnit. If you’ve got a little extra fiber laying around, I’ll bet you could churn out a few new sets of peepers in no time. 3D Blood Spatter Effect – Think your home could be the setting for a new episode of CSI? This decoration idea is for you! This is a Halloween how-to that Etsy put out last year, with the help of Meg Allan Cole from Threadbanger, and I thought it was so cool, I wanted to share it with you this year. I like their idea of using it as a photo-op area. These are just a very few last minute ideas. I hope they help get your creative juices going! 3 Responses to "A Last Minute Halloween Party Roundup"
Very cool finds here! Thank you so much for showing off my whoopie pies! I made a double batch the other day and they are GONE! Thanks for linking up my cupcakes. You’ve got a lot of fun links listed and I’m off to check them out. Thanks!